Retreaver is designed around call data, and in Retreaver call data is presented as tags. Tags are added to calls to associate data about a caller and their context with the call. Tags applied to Buyers act as filters and determine how calls are routed. Tags are also included in reports for the analysis of phone calls. Reporting in Retreaver includes all call tags that have been associated with a call, and to view the tags simply open the Call Log, drill down on the call_uuid for an individual call, or export a call report including Tags as a column. Retreaver provides commonly used tags out of the box but also give you the freedom of creating your own tags allowing for more control and customization over your routing efforts. Tags have a wide variety of properties that are covered in our guide on Tag Types and Operators. The simplest way to add data to a call is to tag the number that is being called. Calls that go through the number will inherit all tags on the number. When you add or edit a static number, open the Tag Wizard and add Tags. Typically numbers are tagged directly for offline source tracking or A/B testing of campaigns in offline or dedicated channels. For example use one number tagged with newsletter:May for a May newsletter and another number tagged with newsletter:June for a June newsletter, allowing you to know which newsletter is driving more calls. In contrast to using static numbers, Retreaver.js allows you to apply tags to numbers dynamically from your website. Retreaver.js allows calls to be tagged with data from URL parameters, form fields, and other information from the page itself like the detecting the visitor's browser and operating system or HTTP referrer. Using Retreaver.js requires a Number Pool, and you'll have to add our code snippet to your site using Google Tag Manager or by manually editing the HTML. Parameter Mapping - Ads, referrers and other sources likely send traffic to your landing pages and include URL parameters to track data attributes such as source, channel and medium. These parameters are easily mapped to the call using Parameter Mappers on the campaign. Programmatic Tagging - Retreaver.js is configurable to allow data to be added to calls based on events on the page. Add, remove and replace tags on the current tracking number based on events such as page load, form change and form submit. Read about the Retreaver.js configuration options here. Web Form Tracking - Retreaver.js can track form values in real-time on your landing pages. By mapping form fields and generating new tags when a form is submitted, the number dynamically placed on your page can be tagged prior to calling. For more information visit our guide on Real-time landing page tracking. Tags applied to call endpoints (buyers) act as filters. Tags can have an IVR prompt associated with them, so that we can dynamically prompt the caller for a response. When attempting to route a call to a call endpoint that has a tag filter, we'll play the prompt associated with the tag key, as long as the call isn't already tagged with a value for that key. For instance, if I have a buyer that only takes calls in Spanish, I can tag the buyer language:spanish. When we're attempting to route a call to this buyer, and the language is unknown, we'll play the associated prompt to get a value from the caller. Created tags that are associated on a Buyer level act as a filter for that buyer. You can add duplicate keys with different values but at least one value must match with the key in order to route to that Buyer. You generally want to have a fallback Buyer that takes any value for a given key. If a buyer accepts all values for a tag key, simply leave it untagged. It is not necessary to tag the buyer with all possible values for the tag, unless you want to force the associated prompt to be played. 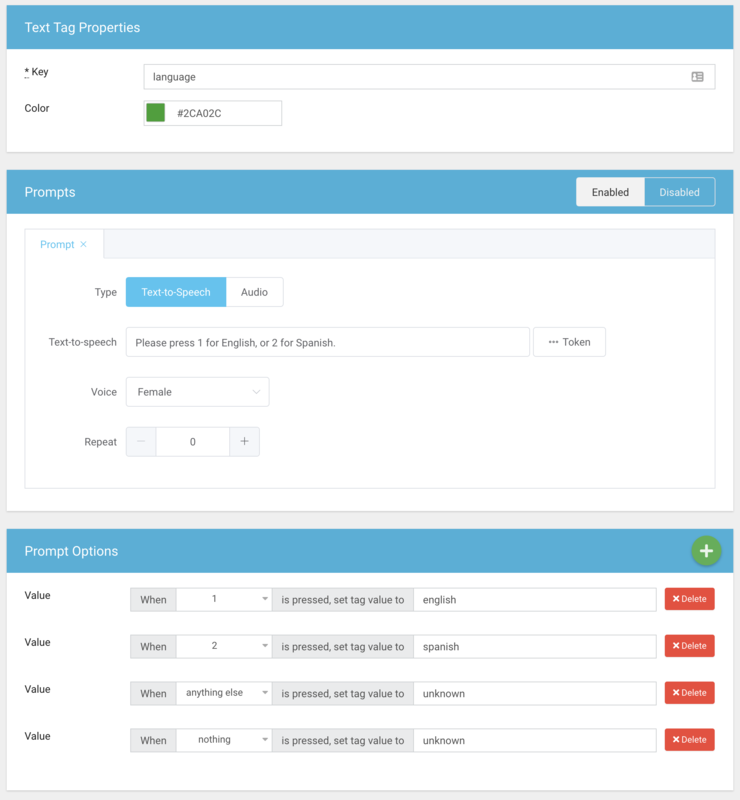 You can also exclude certain values from being routed to a buyer by tagging the buyer language:!=spanish. In addition to tags you create, there are also built in tags like publisher_id which can be used to exclude certain publishers from being routed to certain buyers, simply tag the buyer publisher_id:!=1234. Any criteria you can think of can be used to route traffic within Retreaver using tags. Our Retreaver.js click-to-call (call-me-now) functionality is used to place a call to a visitor on your website when they request it via a form submit or button press. Tags passed in with the click-to-call API request will be applied to the resulting call. This functionality negates the need for a number pool, as the tags are applied to the call directly and not the number displayed on the screen (if any). Retreaver provides multiple ways to exchange data with 3rd party systems and at various stages of a call. Our webhook "ping" functionality allows you to reference tag values through replacement tokens, passing known information about a call out to 3rd party systems or data appending services, and receiving a response which includes more tags to be applied to the call. Retreaver supports a growing list of third party integrations that can help you stay organized, manage your phone calls or modify your call tags. Retreaver also supports a number of native integrations with systems, such as HubSpot. In these native integrations a set of pre-configured tags are populated for calls and callers. Sample of a call being tagged with HubSpot contact data and Zendesk contact data prior to routing to a buyer.